ICE APPLE: I recently found a bottle of ICE APPLE WINE on our quality control retention rack from vintage 2010. This wine had six years of bottle age. I was not quite sure what to expect prior to opening it. So we pulled the cork on this oldie and poured. This wine was gold in color, but not to the point of being browned. 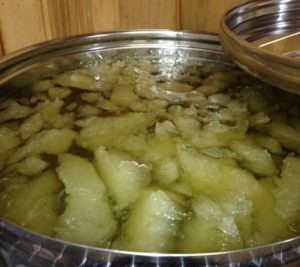 The aroma of the frozen apples was still very strong and pleasant. The wine developed complexity from being bottle-aged with beautiful caramel hints but showing no oxidation, just a nice ripe apple aroma and nice bottle-age bouquet. (“Aroma” in wine refers to the fresh fruit or grape aromatics. “Bouquet” is everything else that happened to the wine during storage, barrel treatment, aging, etc.) I am guessing that this wine has aged to about its peak, maybe another year in the bottle under optimum conditions. So six or seven year’s bottle age for this type of Logan’s View Winery ICE APPLE wine seems appropriate. CHAMBOURCIN 2008: We normally recommend a maximum of 3 to 4 years for this Chambourcin, but this was nine years old! It was showing its age, but it was an excellent example of a beautifully-aged dry red wine for about half an hour after we opened it. There’s a delicate bouquet reminiscent of cedar, tobacco leaves and violets that an oak-aged red wine will achieve after long time in its bottle, and this wine had it! We still recommend around two years maximum bottle age for our fruit wines, and maybe up to four years for barrel-aged Chambourcin, but it was nice to learn that LOGAN’S VIEW wines can age with good results. The new barrels have arrived for the 2017 vintage. 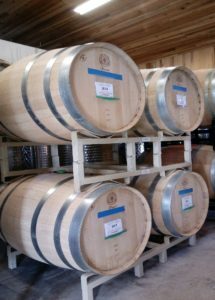 Seguin Moreau Chateau Transport barrels now are storing the 2017 vintage of Commonwealth, Merlot, Cabernet Franc, Cabernet Sauvignon and Chambourcin. All are very nice wines with full tannins that will require approximately ten to twelve months barrel aging to soften and integrate into smooth wines. We also have been informed that we have been awarded Bronze Medals at the 102nd Pennsylvania Farm Show for the following wines: Darv’s Special, Cracklin’ Rosé, and Cabernet Franc. Now that harvest of grapes is finished and the wines have been fermented, we begin to clarify and stabilize the wines. Clarification is done primarily by settling and racking (pumping cleared wine after it rests in a tank for approximately 3 to 4 weeks to an empty tank) and by filtration by pumping wine through filter pads at low pressure to remove particulate matter. Stabilization for grape wines primarily involves removing “tartrates”, chemically known as potassium bitartrate. Wines which have not been cold stabilized may precipitate tartrates or “argols” in the bottle, harmless enough, but gritty. They are NOT sand, broken glass, or sugar. People consider them unsightly. The recommended minimum “cold” service temperature for white wines, rosé wines, and blended red grape wines (Logan’s Blue, Blackberry Nights, Sangrias) is 38°F. If you chill wine much lower than this by say, putting a bottle of wine in a freezer, you risk not only freezing the wine out of the bottle, making a mess, and possibly breaking the bottle, but also precipitating more “wine diamonds” or tartrate crystals. So, no lower than 38°F, please. So, keep it cool, but not too icy! Enjoy a glass of Logan’s View wine in good health. Sometimes winemaking is as slow as government processes. Let me restate that: sometimes winemaking is two to three times faster than government processes. Grape harvest has finally ended, as of November 10, the latest harvest I’ve ever seen since 1981. We were three weeks late in grape processing, with four weeks’ worth of work jammed into three weeks. (9 tons in one week when we usually process 3 tons per week). Quality has been very good this year, with some old vines producing some extremely good quality fruit with lots of aromatic compounds and plenty of flavor. Quantity was down slightly, perhaps 10% to 20%, and sugars slightly less (21% as opposed to 22%), but the dry, clear, and consistent late ripening weather gave us some very good ripening days with flavor and aroma development in the grapes. The final juice to reach the fermenter was Riesling, as of November 10, and it’s just now finishing its fermentation. 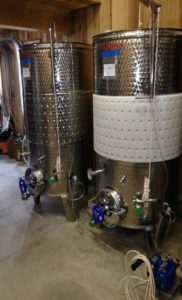 The fruit wines are progressing very well in stainless steel tanks (yes, we will have Bing Cherry and Strawberry wines again), the reds have been pressed, assembled and are now in oak barrels, and whites and rosés are undergoing initial clarification. In all 2017 appears to be a very nice vintage. So, enjoy a glass of Logan’s View wine in good health! This week we processed three tons of Chardonnay, and two tons each of Cabernet Franc and Cabernet Sauvignon. While sugars are slightly lower than previous vintages, the fruit is ripe, good, the reds are giving good color and body and the Chardonnay will be done in a style reminiscent of French Chablis, with good acidity and crispness. Incidentally, when I graduated in 1976 from Fresno, I had a job off from Jean Moreau at Maison Moreau in Chablis, Yonne, France, but had to decline the job offer due to the fact that my wife did not have a secured income (as required by the French Government), and I would not have been earning enough to support us both. We returned to Pennsylvania where I was hired by Pete Wood as Winemaster at Pequea Valley Vineyard and Winery in Lancaster County. I must admit: this is the only “woulda-coulda-shoulda” thing in my life that I wish we could have had the chance to pursue. Enough about old times. The current time has us with a very challenging and late vintage, but the grapes’ ripeness looks good, and the wines in the fermenters are progressing well. Enjoy a glass of Logan’s View wine in good health! Steve attended California State University, Fresno where he earned his degree in Enology. He has worked at various vineyards/wineries in California including Ficklin Vineyards (Madera) & Roma Winery (Fresno). 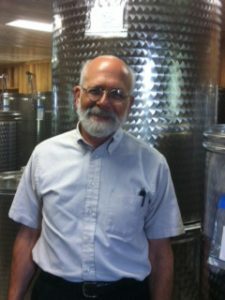 He owned & operated his own winery in Brogue, PA from 1978-1989, called Stephen Bahn Winery. He took a hiatus from winemaking until he was hired by Logan’s View in August 2013. Since becoming winemaker at Logan’s View, Steve has had 25 wines recognized with Medals in wine competitions.